Between bouts of work on my mystery novel, I tinker with a literary work. It’s so serious I can hardly shift it most of the time, but it does have lighter moments. Since it takes place in Ireland, those moments often involve saints. 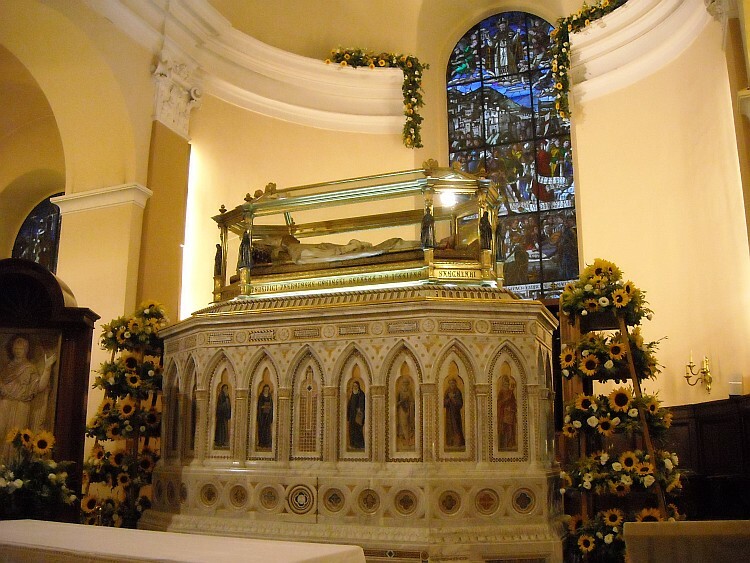 Ireland favors saints who are hard to pin down, some of dubious origin. They tend to be knowledgeable about human wants and needs, and indulgent of them. I’m far from the final cut on which sanctities will be included. This makes a perfect excuse for “research” that takes me away from the grunt work. Today, I offer you a sampling of my favorites. all the pagans, asked and received a boon from Christ: on Judgment Day, Christ will judge the living and the dead – except for the Irish. They will be judged by Patrick. In life, Patrick was not a forgiving sort, but for his own people…. 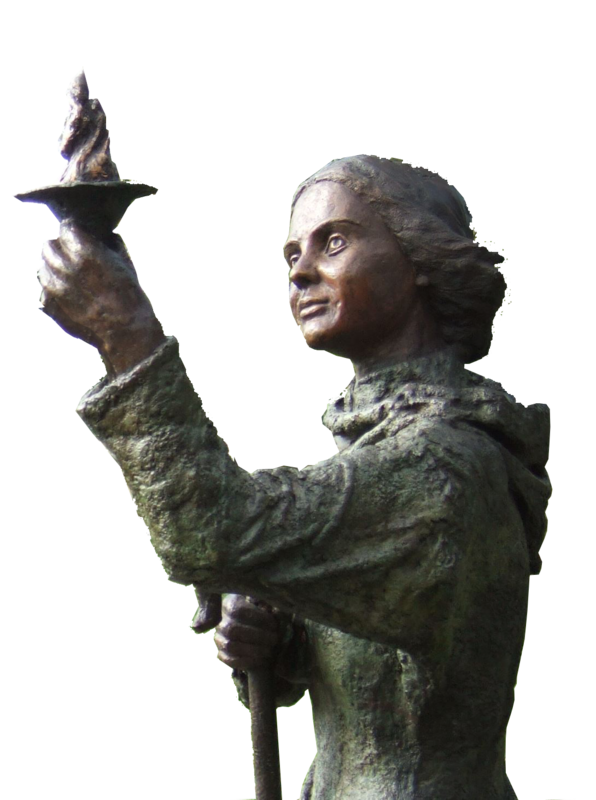 St. Brigid is sometimes called the “second most important Irish saint.” Patrick, being male and alleged founder of the faith in Ireland, is number one. Officially, the church doesn’t care for women in the top job. 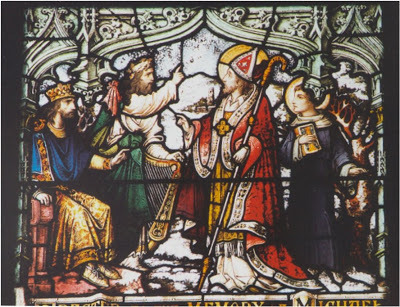 But Brigid is “the Mary of the Irish.” According to her legend, when she went to take the veil from Bishop Mel, the Holy Spirit caused him to read the form for ordaining a bishop over her. In fact, Brigid predates Patrick. 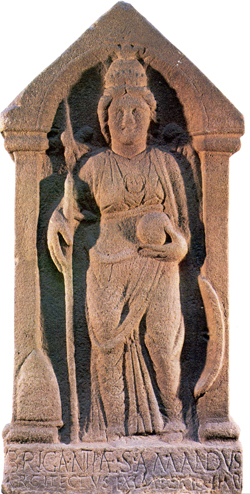 She began her career of divinity as Brigantia, “the high one”, a Celtic goddess (seen in a Roman-era relief at the top of this post.) She is the saintly patron of blacksmiths, doctors and poets – metallurgy, medicine and poetry were the three magical arts of the pre-Christian Celts. Brigid’s symbol, the cow, was the store of wealth and unit of account among the pagan tribes of Ireland, and her miracles include the sudden appearance of milk, butter and cheese in vast quantities, as well as beer, beer, beer. Irish priorities are clear: first the beer, and only then the loaves and fishes. On one occasion of drought, she converted her bathwater into beer, a very Irish conversion. She could also hang her cloak on a sunbeam. 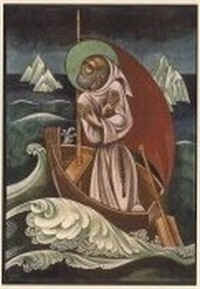 St. Brendan the Navigator was an Irishman, and his tales are tall. He set sail in a curragh — a boat not much more than a cockleshell made of hides and waterproofed with fat. In it, he traveled west across the Atlantic for seven years to the “Promised Land of the Saints,” the “Land of Promise” or perhaps the Garden of Eden. Mind you, he only went because St. Barrid told him that he, Barrid, had already been there. On the way, Brendan landed on a whale, saw floating crystals as high as the sky and was pelted by burning rocks from an island, so clearly he got as far as Iceland. Brendan also encountered Judas, sitting drenched and miserable on a rock in the midst of the sea. Judas explained that this was his Sunday holiday; the rest of the week, he spent in Hell. The church insists that Brendan’s journeys were for the purpose of converting the heathen and founding abbeys. He is the patron of Clonfert Abbey, so that just shows. I don’t plan to confine myself to Irish saints. The Irish venerate whatever saint can best deliver what is needed (for a certain value of ‘need,’ which includes beer.) 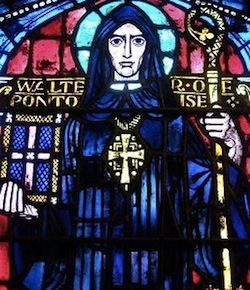 My heroine will have recourse to St. Walter of Pontoise, a sad fellow from a place near Paris. Walter wanted only to be left alone in a monk’s cell to fast and pray, but the King of France appointed him abbot of the monastery. The poor man ran for it but was caught and brought back. This happened several times. Finally, the pope put his foot down and told Walter to stop complaining and do his job. Now, he is the patron saint of people whose jobs are getting to be too much for them. Another favorite of mine: St. Ubald of Gubbio can be invoked against headaches, which I take to mean anything that makes a nuisance of itself without justifying immediate flight. If things get even worse, St. Ubald is said to have miraculously defeated an invading army and talked Frederick Barbarossa himself out of sacking the city of Gubbio. More: he is invoked contra omnes diabolicas nequitias – “against all diabolical depravity.” I presume I can involve my heroine in absolutely anything and get her out of trouble in the end. Posted on March 5, 2016, in Heidi Wilson, research, Uncategorized, writing and tagged Brigantia, Celtic goddess, Ireland, Irish Catholics, lake of beer, saints, St. Brendan, St. Brigid, St. Patrick, St. Ubald, St. Walter of Pontoise. Bookmark the permalink. 1 Comment. So happy to hear that Judith (I assume that’s to whom you are referring) still lives on! Bathwater turned into beer? I’ll stick to my Coors Light, thank you very much. Although I do say I like my beer to taste as close to water as possible–just not bathwater! !